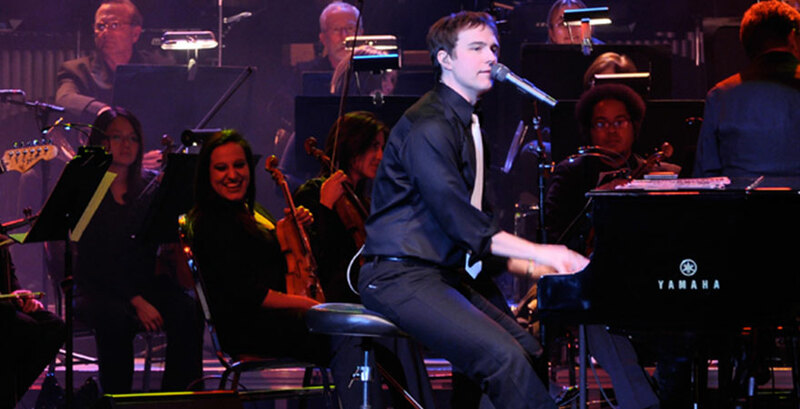 Michael Cavanaugh, his rhythm section and the New Jersey Symphony Orchestra (NJSO) rocked the State Theatre New Jersey with the Greatest Hits of Elton John and More this past Sunday. A “Pinball Wizard” overture segued into “Philadelphia Freedom” as the charming and talented Mr. Cavanaugh joined the NJSO on stage. 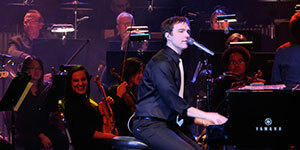 His musical life began at age seven when he first played piano. It was during his tenure as a piano lounge player when Billy Joel discovered and hired him to play the lead in Broadway’s Movin’ Out. When he was a kid, he and his band would use a synthesizer; but he was ecstatic that in place of the synthesizer, the NJSO was performing a long introduction to “Funeral for a Friend.” I’ve been to a few NJSO performances, but I’ve never heard them play rock-and-roll. Conductor Thomas Wilkins led the impeccable musicians. Conductor Wilkinson talked about musical terms such as motifs and then went into licks and riffs as Michael’s band and the orchestra played snippets of songs including “I love Rock n Roll,” “Another Brick in The Wall,” and “Smoke on the Water,” riffing away. They paid tribute to the band Chicago for their 50th anniversary, playing segments of their songs. One of the last songs of the night was “Don’t Let the Sun Go Down on Me,” one of my personal favorites. The State Theatre’s playbill points out that he is a "new voice of the American rock-and-roll songbook" so it was fitting that he played “Old Time Rock n Roll” for the encore. His style, class and infectious enthusiasm for music coupled with his band and the NJSO made for a wonderful show. He mentioned he would like to bring his Billy Joel and More show to the State Theatre, and if he does, be sure to see him.